When Fake News report on Trump they throw out all the customary rules of journalism and bend convention out of shape. Standard rules no longer apply. Take two areas for example; celebrity aliases and prank phone calls. Journalists have been dealing with both for more than a century and know all about the traditional way to approach each. In this article, I will show how they ignored the rules regarding each, in a shameful attempt to discredit Donald Trump. What’s more, they did this without even covering their tracks. The anti-Trump media took a few bits of information about their target’s aliases and made a childish mash-up with them, before launching a simultaneous multi-pronged attack as is their SOP. This would confuse the public into thinking that Trump was some kind of crazy person making weird phone calls and begging for publicity. 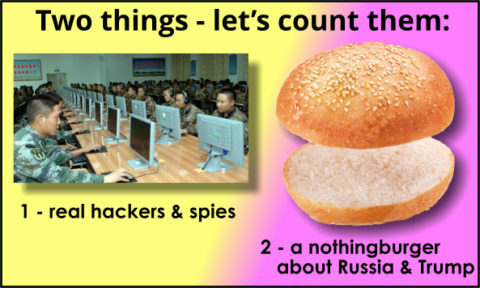 It was another nothingburger. One of the first things journalists learn is that stars, billionaires, and politicians often have to use pseudonyms or aliases as there is no choice. Without them, the VIP (Very Important Person) might be attacked, assaulted, abused, kidnapped or murdered. The whole point of a pseudonym is that you don’t reveal it to anyone; not just to protect the VIP, but their partners, children, and staff. All are at risk should the VIP’s identity be exposed. Using the alias for booking hotels or restaurants prevents the media finding out. Most journalists are taught to respect aliases, and reporting them is frowned upon as it could risk lives. Nonetheless, some gutter-press reporters publish or broadcast such information, so it pays to be cautious. When a VIP denies having an alias, it is not technically lying because safety and force are involved. When it comes to saving your children, denying an alias is described as security. We don’t call the President a liar when he says, “No, I’m not booked in at the Hilton as ‘Mr. Smith.’ We call it ‘national security.’ Most (if not all) Hollywood stars use aliases, and half the celebrity talking heads in Fake News do too. Journalists know all this. The famous ones use aliases themselves. Don Lemon probably uses the name “Lon Demon” as a joke. If so, it would be a good choice. Every Newspaper and TV network has pranksters calling, pretending to be VIPs. Fanatical fans, jokers, political trolls, obsessed fans or mentally unstable loons will pretend to be everyone from the Queen to the Boston Strangler. Police have a difficult time with fake criminals confessing to significant crimes. 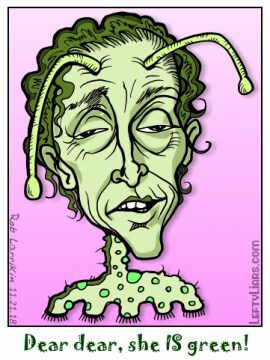 There are thousands of pranksters in every city, and any two-bit TV manager or newspaper editor knows about them. Even suburban phone users know about them. The first thing to decide when receiving a prank call is whether they sound like the VIP in question. Obviously, most do not. Then there is the content of their words. If a prankster was able to talk like Adele but said, “I am going to kill your family,” you could safely assume it was not Adele. Journalists are taught all about this. They are cautioned to be wary of all unbelievable tales, especially over the phone. It is essential to verify the callers identify with a name and address, and have some way to authenticate them as a legitimate source. When Donald Trump announced he was running for office Fake News abandoned all protocol concerning celebrity aliases and prank calls, for him. 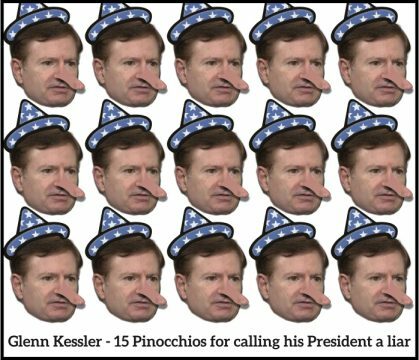 Let’s take a look at just one of these multipronged attacks by Fake News, and undo their Lefty Lies. We start with the gossip rag People Magazine, which must have been desperate in 1991 when they published a story about their anonymous reporter receiving a call from a “John Miller” who claimed to be “handling Donald Trump’s publicity.” An “anonymous source” recorded the call. According to the 1991 article, it was “probably not” Trump. Even though they said it was probably not Trump, People Magazine went on to say that their anonymous source said another anonymous source “ID’d the voice” but the anonymous source forgot to say WHO her unknown source identified the voice as. Fragment? That smells fishy. 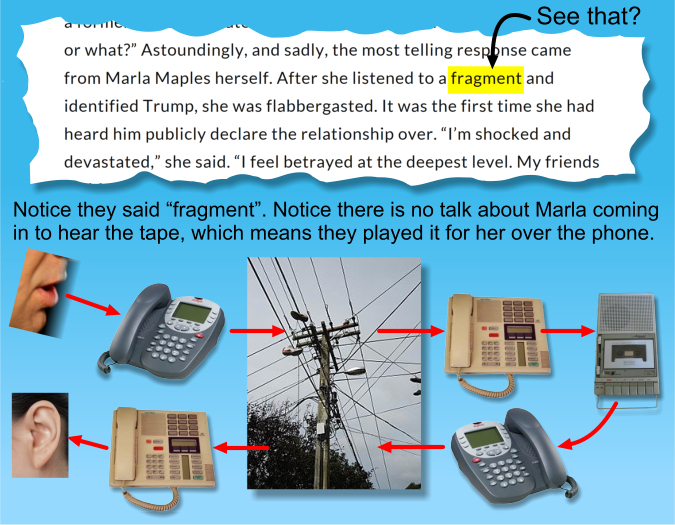 I can imagine Marla saying, “No, it doesn’t sound like him, except for a small bit,” so they come up with the word ‘fragment.’ Also, they obviously played the tape over the phone to Marla, who just took their word when they told her they thought it was Trump. In reality, the tape sounds nothing like Trump, but they would have told her it was scrambled and re-hashed eight times between the spoken words and her ear to explain its poor quality. This particular prank caller has a New York accent and is hamming it up as Donald Trump, and some would say he’s doing a good job. To them, all New York businessmen sound like this. Sue Carswell was conned by a prankster. She ignored the usual rules regarding hoaxes, and took it seriously, without verifying the caller’s identity. You should never sit around gossiping about what you think about a bad recording – some pranksters are brilliant and can fool reporters easily. Instead, you ask a bunch of questions and verify the person’s background, check up on them and make a decision that way. Twenty-five years later Trump was heading into an election and was looking like he might win. A quarter of a century later and Fake News went on the alert! The order was sent out. Find anything you can to use against Donald Trump. Any bit of gossip will do. The desperadoes dug this inane People Magazine article up and decided to create a giant nothingburger with it. So all of a sudden it is a fact. It went from “probably not Trump” from People Magazine to “It was Donald Trump pretending to be John Miller,” courtesy of Frontline PBS. Trump, who said many times that it was not him, was tried and found guilty by Fake News. They now broadcast it as a fact, without any evidence. We now know, after the Ford/Kavanaugh scandal, that Fake News and the Democrats don’t believe you need proof to find someone guilty. You just go right on ahead and find them guilty if someone accuses them. There’s no need for the presumption of innocence. On 25 May 2016 Sneering Jimmy Kimmel interviewed Trump, bringing up the nothingburger about John Miller. Trump: To me that didn’t sound like my voice. Kimmel: But to me it sounded just like you. 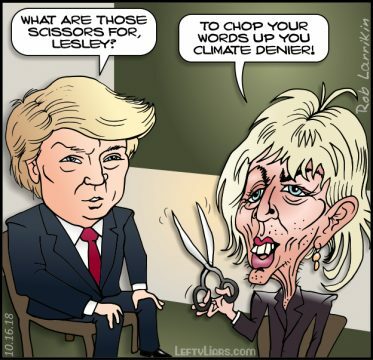 Trump: Really? Is that right? Trump: –nobody knew me so it wasn’t so much so important, but I would never want to use my name, because you had to pay more money for the land, if you’re trying to buy land you use different names. Kimmel: What names do you use? Trump: I would use, I actually used the name Barron, and I ended up using my son because I made a very good deal using that name. I used an alias in terms of setting up a meeting with Mr. Donald Trump. Trump “said” he used the name, Barron. “Confession” insinuates some kind of crime was committed. 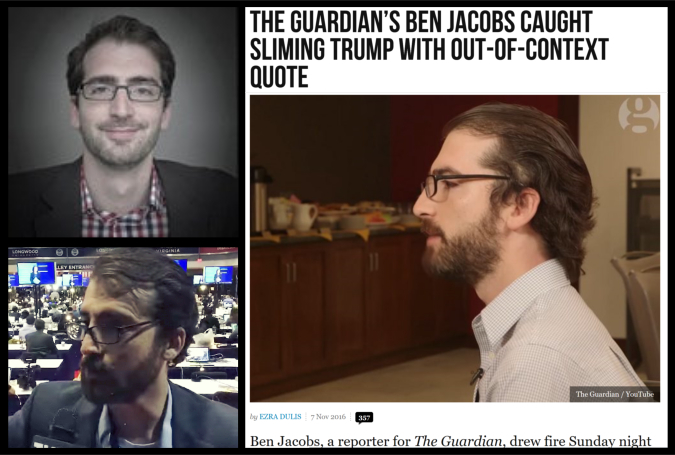 Wow – the Fake News is strong in this Ben Jacobs. So who is Ben Jacobs anyway? That would be 35-year old Trump-hating North Dakotan millennial snowflake Ben Jacobs. During college in Iowa he was president of the College Democrats, then a freelance reporter for The Daily Beast before working for The Guardian. 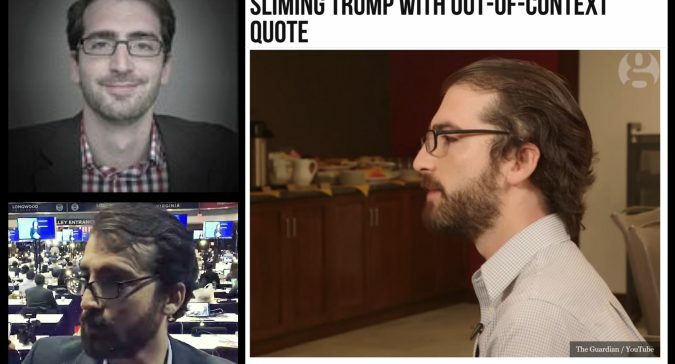 He is based in Washington, D.C. Here’s an article about his “sliming” Trump with a misquote.